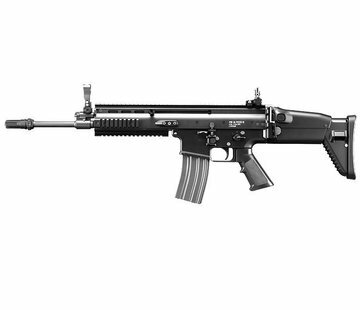 Constructed from simliar polymers of that of the real steel G36 assault rifles, Tokyo Marui has designed and produced their brand new series of Automatic Electric Guns, what's special about this new line, is that of the Recoil Shock System. The new Tokyo Marui Model 36K features a new recoil and shooting engine with 300g of additional weight on the gearbox and mock gas piston to facilitate in generating a realistic recoil when firing. The Recoil Shock System is one of the more effective and reliable simulated electric recoil systems in the market today with a reciprocating charging handle that "blows-back" along with the mock bolt cover. Not only is there a new recoil and shoot engine to look forward to, Tokyo Marui has even installed an integrated 3x Rifle Scope with decent eye relief for skirmishers who wear goggles. The scoped carry handles even features short 20mm top rails for the installation of your choice of additional optics. Includes 1x 50rds Low Capacity Magazine.